Some military bases – like the U.S. Army’s Fort Irwin National Training Center in the Mojave Desert - exist in harsh, remote environments where access to water and energy are serious concerns. Water conservation is a key issue at the base which gets two to four inches of rain yearly. Fortunately, the desert environment means the center also gets plenty of sun, allowing for the development of solar power. 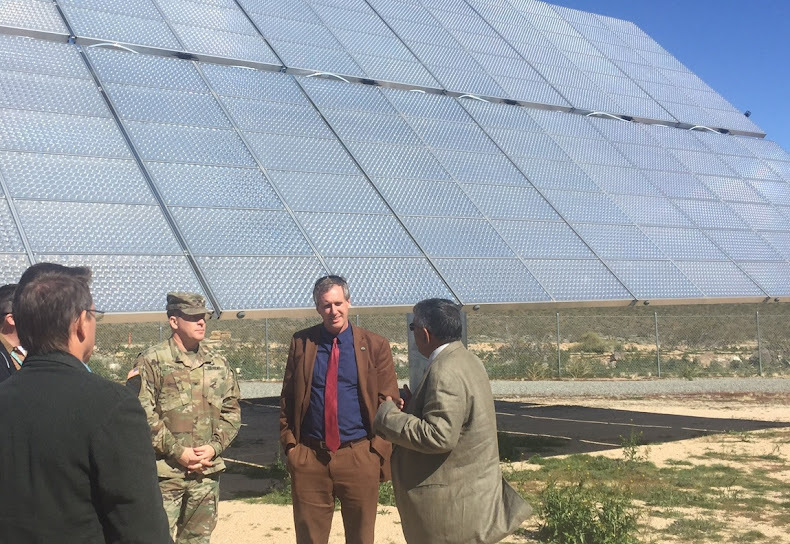 Assessing how the base is using renewable energy and conservation practices were on the agenda for California Energy Commissioner David Hochschild’s recent tour of the base. The renewable energy activity at the base is an example of how the Army is embracing renewable energy in the Mojave Desert. The visit was one of a series of recent base visits by Energy Commissioners. The visits are part of the Energy Commission’s partnership with the U.S. Department of Defense to help installations transition to renewable and alternative energy. There are 30 military installations in California – more than any other state in the nation. The base, which has a daily population of roughly 20,000 residents, is where the military holds joint and combined arms training for units before deployment overseas. At the base, Hochschild toured a 1 megawatt (MW) photovoltaic array and recent energy efficiency upgrades including a major light-emitting diode (LED) upgrade to a large vehicle wash facility. Hochschild also visited a new LEED Platinum-certified hospital with 2 MWs of renewable energy from photovoltaic and solar arrays. The base also has a large water purification project. The project is a crucial one since groundwater at the base is high in fluoride and arsenic, and the water system is privatized. The remote location means that the base operates on a single Southern California Edison utility line that is more than 30 miles long. That poses grid challenges such as the threat of sudden power outages and the need to schedule two major outages a year for grid repairs and upgrades. The base is working on completing a new microgrid that will allow it to use more clean energy and enable it to replace a diesel generator backup system. Hochschild’s next military visit is the Naval Air Weapons Station at China Lake in April.